The sirens called across the dank lagoon, breaking into my hard-gained sleep during a hot and humid night. The lagoon waters in front of the Piazza San Marco which leads the big cruise ships to their berth was already a choppy sea from an approaching scirocco. Aqua alta was now imminent and a day in the hills seemed like a good idea although a high tide and incipient scirocco might mean a sloshy return to where I was staying as the sandy waters roll into the locked harbours. The view from 'osteria senza osta' (tavern without a host) looking out across the Cartizze hills near Stefano di Valdobbiadene. The winery of il Colture is nearby. The station of Santa Lucia in Venice (so-called after the church it replaced) is fronted by an impressive 1930s fascist façade with the emblem of the FS (Ferrovie dello Stato) emblazoned over its front entrance. Amidst departures for the famous European cities – Milano, Roma, Monaco, Parigi – are the local connections such as Conegliano, an hour by train, which takes one to the spiritual home of Prosecco. On Fridays there is a market there where they sell a panoply of household goods, winemaking gear for domestic purposes, clothes, and food. To attain the hills of Santo Stefano one needs a car which can be rented in Conegliano. Valdobbiadene is only about 25 miles away but it takes about 50 minutes due to the small winding roads. Imagine... a beautiful hut with tables on a terrace outside overlooking a valley designated a UNESCO World Heritage Site. I had found the eponymous Osteria senza Oste (more colloquially 'senz'Oste' - tavern without host). 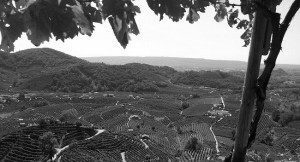 In front of you the serried ranks of vines climb the hillsides of the much-prized 'Cartizze'. The elevation of some 800m provides a welcome respite from the heat of the plain. 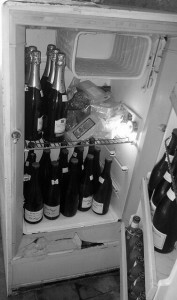 That morning I had claimed a couple of bottles of Prosecco from nearby producers – il Colture and Bisol. 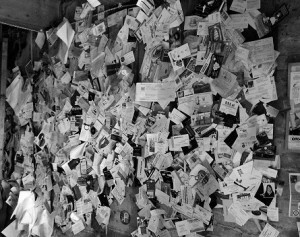 A tradition that visitors pin their cards to the wall whilst there is also a guest book for your comments. Tableware is provided and is all neatly laid out on shelves around the rustic building. However, there is no space to eat indoors - who would want to? Leave your comments in the book, pin your card to the wall and if you feel like it leave a sizeable tip... service isn't included. Here are two producers you could incorporate into a visit into in this region and the Osteria senza Oste. Both offer excellent and diverse examples of Prosecco. Le Colture have an 'agriturismo' where you could extend your visit over many days, or if heading for Venice then you should consider Bisol's restaurant/hotel Venissa. A boutique winery which makes some excellent wines: brut Fagher to the classical extra dry Pianer. One of the largest producers of Prosecco with a range to match - from the brut: Crede (a blend of Glera, Pinot Bianco and Verdiso); Garnéi - single variety Glera with a longer maturation; to extra dry and dry styles including a passito. Try their wines from their 'Jeio' range - including an extra brut which is unusual from this part of the world and NOSO2 (with no added sulphur).